18kt yellow gold and chocolate diamonds ring 2.5300 ct of diamonds. Ornate elegance shimmers from this ring. Designed with polished 18K yellow gold, the center of this ring glows with one round diamond cut 6.5mm citrine in bezel setting. Adding delightful sparkles are 130 round full cut chocolate diamonds in pave settings. This ring has a setting size of 9/16" x 15/16" and a height of 1/4". 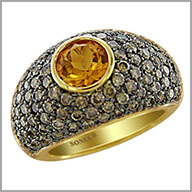 The citrine weighs 1.000ct and the total diamond weight is 2.530ct, both approximate. The diamonds have a SI2 clarity.